Bathrooms are damp and can use a lot of power. This creates special needs when it comes to wiring. This article will help you plan for appropriate electrical wiring to cover lighting, airflow, and safety devices in your bathroom. Everything from watertight lighting fixtures in bathing areas to effective ventilation to GFCI outlets for safety must be considered. We all know that bathrooms tend to be one of the darker rooms of the house. For that reason, plenty of lights should be installed to provide enough general illumination but also to enhance areas like mirrors, showers, closets, and bathtub areas. 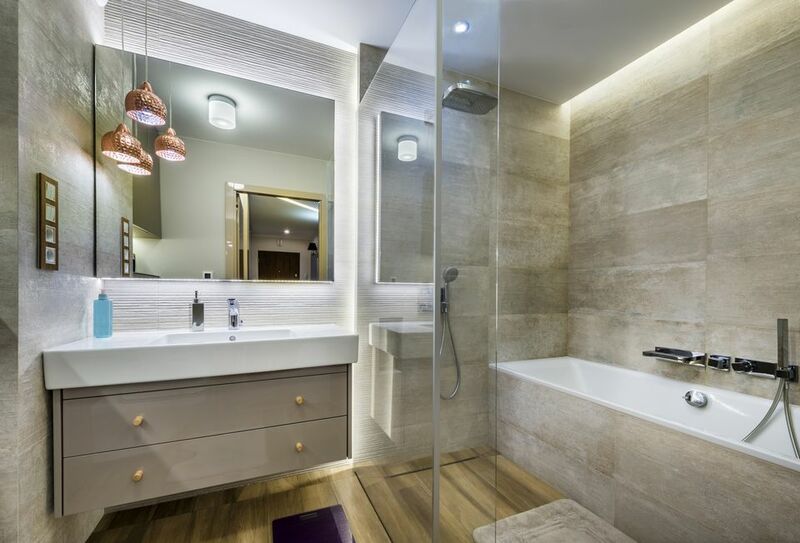 Bath and shower areas must have special fixtures. Light fixtures for these areas carry one of two ratings: damp locations and wet locations. A bathing area, sometimes called the "shower zone," includes the tub or shower area itself and the adjacent room area measured 3 feet horizontally from the rim of the tub or shower stall (that is, measuring straight out into the room) and 8 feet vertically from the tub rim (measuring straight up). Any light fixture in this zone must be at least rated for damp locations. However, if the fixture is potentially subject to spray from the shower, it must be a rated for wet locations. When it comes to lighting around the mirror, side lights are best. Overhead lighting, especially recessed lights, leave your face in shadow when you get close to the mirror. They also highlight how much your hair is thinning (isn't it better not to know?). Sidelights, such as wall sconces or vertical strip lights, can be combined with lights mounted on the wall above the mirror for fuller illumination. Bathrooms are notorious for being moist, and some don't have windows to remove the moisture and odors. Even if you have a window, a bathroom vent fan is more effective at exhausting moisture and odors, and you don't lose as much heat in the winter. Vent fans are required in all new bathrooms and remodels. You can install a vent fan with a built-in heater, but this has different wiring requirements than a standard fan without a heater (we'll get to the wiring in a minute). All outlets or receptacles in a bathroom must be GFCI-protected. This is a critical safety device to help prevent shock hazards, a very real concern in a bathroom. You can provide GFCI protection with a GFCI circuit breaker or by installing one or more GFCI outlets on the receptacle circuit. When using a single GFCI outlet for protection, it must be wired for "multiple-location" protection so that it protects all of the outlets downstream on the same circuit. A basic wiring plan for a bathroom includes a 20-amp, GFCI-protected circuit for the receptacles and a 15-amp general lighting circuit for the switches, light fixtures, and vent fan. In some areas, the lighting and receptacles must be on separate circuits so that if a receptacle trips the circuit breaker, the lights won't go out. In other areas, it's permissible to install the lighting, receptacles, and a standard vent fan on a single 20-amp circuit provided the circuit serves only the bathroom and no other rooms. If the vent fan has a built-in heater, it must have its own 20-amp circuit. This is called a "dedicated" circuit because it serves only one appliance or fixture. Heat lamps, wall heaters, and other built-in heating appliances may also require dedicated circuits. Learn about bathroom wiring requirements in your area by contacting the local building department. How Do You Prevent Electrical Circuit Overload? How Do You Read Labels on Electrical Wire?